Tragedy struck as we missed out flight! We were stuck in a taxi in traffic for over an hour and we missed our check-in time by 5 minutes. I could not believe that they would not accept us (especially since it was still 40 minutes until the plane took off). We did have another option, which was trying to get on a plane with another airline - I managed to do that, and United Airlines authorised the transfer, but British Airways would not accept it ... basically a lot of bureaucracy ... time ran out, so we just took the next United Airlines flight to San Francisco, but had to do a stop at Boston which added to our journey time (and we didn't get to do anything at Boston, because we were only there for about and hour and their airport gave us and other people problems too). A recommendation to other travellers ... not airports are created equally, and not all air flight processes are as smooth as others. I have been really lucky up until now, being processed on flights quickly and easily ... in future I will leave more time for these unexpected delays/problems. 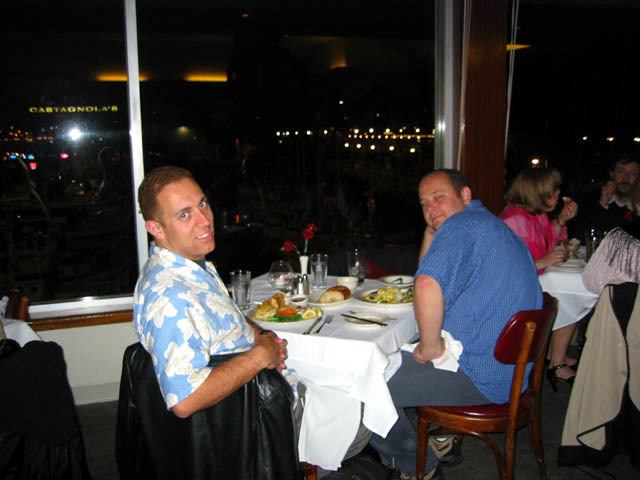 When we got to San Francisco, we relaxed in the hotel for a bit and then went down to famous Fisherman's Wharf for dinner. I got a nice seafood platter for around AU$30 which was exception value considering that there was a good view as well. The service was excellent ... I wonder if that is because the waitress wanted a good tip? Either way, I was delighted with the whole experience. Travelling in San Francisco included using the Cable Cars ... that was an experience in itself ... it was like a roller coaster ride and I really did have to hold on to save my life. I look forward to spending more time in beautiful San Francisco tomorrow (a lot of people consider this to be their favourite US city).